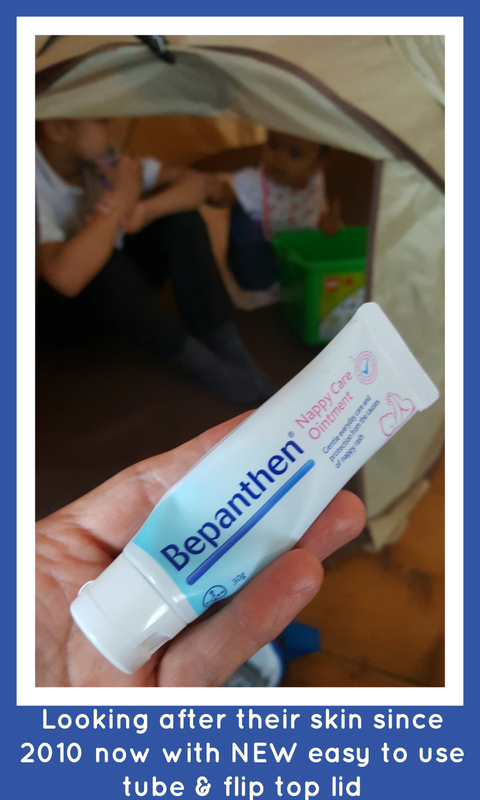 We were posted a 30g sample of Bepanthen by BritMums for the #bepanthenbedtimechallenge and the timing could not have been better, although I did not know that at the time. The timing was perfect because Lottie recently got rushed to hospital in an ambulance. We spent last night in the hospital. Lottie vomited Friday night and had a high temperature but we monitored it all weekend and there was no further vomiting and absolutely no diarrhoea. Sunday night she had paracetamol suspension at 1930 and asleep by 2000. But she woke 1 am on fire and when I lifted her out of bed to my shoulder she vomited bile everywhere (empty tum as had been refusing food) and I thought I heard bottom sounds so took her down to change her. She then starting shaking a lot and lost all her colour and looked like a green palor. She was limp lifeless like a ragdoll. Couldn't open her eyes. No muscle resistance and unresponsive so I called 111. Based on my answers to their questions they called an ambulance but it took 90 mins to arrive by which time she was a little bit more like herself. I thought therefore they'd not bring her to hospital but her temperature was 39.4 and they did a heel prick test and her blood glucose was high and her heart rate so they brought her in. To cut a long story short we arrived at hospital at 315 but it wasn't till 6 that a Registrar asked for a urine sample which it took me till 730 to get. Turns out she had white blood cells and blood in her urine so now has Amoxyclav for 10 days (antibiotics). Got the prescription at 9 (late somehow due to night / day handovers) but it took till 930 for Boots to dispense it. I didn't get in a minicab home till 10 am but luckily my Mum took Aaron to school. Right now she's asleep. 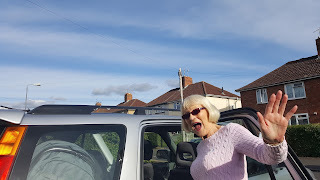 But let me rewind a tiny bit: My Mum flew over to the UK from Ireland Friday 23rd September. Her flight's landing clashed with school pickup so we had to take Aaron out of school 30 minutes early (two of my school mum friends each couldn't have him for various big reasons). Her flying over was a huge deal as she hasn't seen our house, or the baby. We'd last flown to Ireland May 2015, but I only got the positive pregnancy result the very day we flew back, so little *tiny* in utero Lottie actually was in Ireland. But all during my pregnancy and Lottie's early months, we were yet to see my Mum, so clearly I had lots of plans for her arrival and few precious days here. So different to the Aaron days when she flew over when he was 2 weeks old and stayed for 9 weeks. Hubby drove me, Aaron and Lottie to the airport. 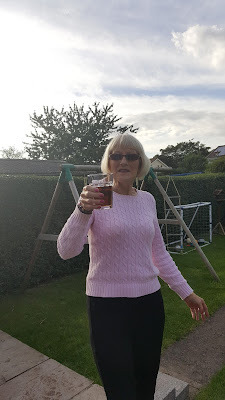 We then came home where she had dinner and a Bacardi and Coke in the garden (what can I say it was a lovely evening). He then drove us all to football as Aaron never misses it (even when I was 39 weeks pregnant and then when Lottie was 4 days old). Lottie literally bounced up and down on my Mum's knee at football and we thought all was well. I gave her a jar there - I think it was ham and pasta. That night I was watching the soaps as Lottie breastfed and slept on my lap. My Mum was out on the patio speaking with Ireland as a relative had sadly passed away that day. Then all of a sudden it was like Lottie went rigid internally like a rod and then her arms and legs started to tremble. I watched her for perhaps 30 seconds and then lifted her upright to my shoulder and ran to the patio. I called my Mum who got straight off the phone and as she walked inside Lottie vomited on us both. It was coming out of her nose too. I was terrified. We looked after her that evening and night and she seemed fine Saturday and Sunday apart from sleeping much more than normal. But Sunday night she was asleep by 1930 after having Paracetamol suspension and woke at 1 am. She made noises like passing something so I took her downstairs to change her. I opened the bottom half of her Sleepsuit at which point she started shivering uncontrollably and was burning up like a radiator so I ran to get my Mum and she vomited several times but where she had been off her food it was all only bile but she wretched several times. I rung 111 as by this time she'd lost all colour and it was like she was quite literally green. My normally muscular strong girl felt like a limp ragdoll in my arms and she was trying to open her eyes and couldn't. Based on my answers to their questionnaire 111 said they were sending an ambulance, but it took nearly 90 minutes to arrive by which time she was more herself, but she still hadn't had any medicine as I wanted them to get a true temperature and kept telling myself they'll be here in a minute. They allowed me to give Paracetamol again when they arrived and it swiftly brought the temperature down but it was 39.4 on their arrival. They said her oxygen levels were okay but were concerned with her heart rate so they took a blood sample from a heel prick. That showed high glucose which can be a sign of infection so they said we'd have to go to the Children's hospital. They said "bring the car seat" (you can see how they strapped her in it in the ambulance in the collage above) but neither they nor I thought to bring the buggy!!!! Thank God my Mum was there as hubby was at work. She stayed with Aaron who slept through it all and took him to school in the morning. Although I'd got up with Lottie at 1 a.m. we arrived at hospital at 3:15 a.m. There were actually 3 paramedics as there was 1 in training, soon to be qualified. Having a sick child is scary but having 3 paramedics in uniform in your sitting room in the middle of the night is even more so. I only started crying when I walked across my front garden and SAW the ambulance and then it really hit me. All the way to the hospital though, she was kicking her legs and smiling at the paramedic. She couldn't see me but as I don't stop talking I think she was content that she could hear Mummy's voice. On arrival we weren't seen immediately and had to wait for a Triage nurse same as if we'd walked in off the street. She then took her observations and we waited what we thought would be 3 hours. During that time a nurse came round and routinely took ops; she gave me a glass of blackcurrant thank goodness. I hadn't come prepared other than with a nappy bag. Oh and as for nappies there was a pile of them on the radiator but I left without them. A fellow Mum leant me one in the waiting room, which is how I know it was wet. When we finally saw a registrar he asked for a urine sample at 6 a.m. and I said "if Triage had asked for one that wet nappy could have been it". I said "how do you get a baby to do a sample?" and he showed me how to balance her above a pot, but I had to do this whilst she breastfed (so she'd have the fluids to pass) AND then while she slept. Turned out she was back in my arms after sleeping and it was 730 when she finally peed. A full 90 minutes after his request. I only knew when I felt it running warmly down my leg (due to the angle of the plastic bowl). I yelped as if I had run the lottery as I thought the sample would mean we could go home, but this was the time the night team handed over to the day team. I heard them discussing us. Turned out the sample had blood (not seen to the naked eye) and sugars in it. She had a urinary tract infection. One team wanted to give amoxycillin for 3 days and the other team wanted to give Coamoxyclav for 10 days. The latter won thank goodness as the former would not have worked. BUT I did not have the prescription in my hands until 9 a.m. and Boots did not dispense it till 930 a.m. I was in a minicab home by 10 a.m. and not home until 10:30. I chatted to my Mum from 1030 to 1130 and Lottie and I hopped into bed and slept till 230 in time for the school run, but my Mum did it and let us stay indoors. The Doctor had said that the antibiotics would make her stools loose to which I confidently replied "they already are as she is breastfed". Little did I know I would still see an effect which was that her normal bowel movement of once to twice a day would increase to five times a day which is where the Bepanthen came in. It really and truly protected her skin during this time and was invaluable. I already knew it was amazing thanks to how it healed her chest when she had a rash on her chest due to too much dribbling months before. Bepanthen is an ointment containing pro-vitamin B5. Pro-Vitamin B5 gently aids natural skin recovery, while keeping it soft smooth and moisturised. Bepanthen forms a long lasting, breathable transparent layer, protecting even the most delicate skin from the causes of nappy rash. I'm also impressed with the new packaging. The tubes were metal when Aaron was a baby and you'd end up squeezing the Bepanthen through a crack in the metal. Now it is plastic which feels way nicer. And you get a better handle on it. It also means it doesn't scratch baby if they get too close. Being transparent it's not messy either. An added bonus is the fliptop lid like toothpaste which you'll see had been requested by Mums on various forums. So it is great to see that they listen to their customers. The increased stools has stayed with us, so she's getting a protective preventative dose of Bepanthen on her bum at every nappy change. I know from the Aaron days, that this is imperative at teething times too, because poo makes for really sore bums then. Literally if even left in a dirty nappy for only a couple of minutes a teething poo is VERY sore - I think the poo is more acidic or something and having researched Bepanthen I think they say that babies bums don't have the same PH on their skin as us, so need protecting. Hopefully I'll have a more cheery blog post for you soon as we've had some fun recently, like an amazing tea party on Sunday. Do you want to be my 3000th follower?